November | 2011 | Only Connect! Charles Shaughnessy review GAME SHOW at New Theatre in Kansas City! When Richard Carrothers decided he wanted to stage “Game Show,” a process that began in earnest about two years ago, he knew he needed a cast that was nimble, adaptable and quick. Because “Game Show” isn’t like other plays you’ve seen at the New Theatre — or anywhere, for that matter. The piece by Jeffrey Finn and Bob Walton, which originally ran off-Broadway 11 years ago, is really two shows occupying the same slice of time and space. There’s a “live” TV broadcast, in which actual theatergoers are invited onstage to participate in a quiz show, and actors operating real cameras are capturing images that are shown on big screens on either side of the proscenium. And then there’s the play itself: a backstage satire depicting cutthroat network politics in which the debonair host, Troy Richards, gradually discovers that he has been set up in an elaborate plot to get him off the show. Carrothers built a unique supporting cast around his guest star, British-born Charles Shaughnessy, who exudes effortless, David Niven-style charm as he interacts with theatergoers as Troy. Carrothers assembled a group of Kansas City veterans as well as a couple of Chicago actors with improv backgrounds, all of whom had one thing in common: They could go with the flow. 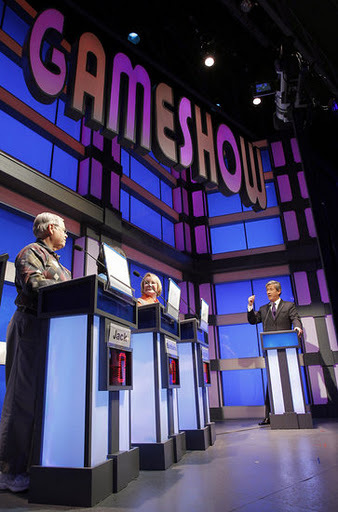 “Game Show” is scripted up to a point, but much of the entertainment is found in the unscripted moments when actors relate to real people from the audience. “It’s going to be a different show every night, depending on the mood of the audience and how much wine they’ve had,” Shaughnessy said one afternoon during a rehearsal break. Shaughnessy said he has never done improv, and he has never appeared on a game show, but you’d never guess it by watching him work in this production. He and his fellow actors form an ensemble of equally crucial components and share the stage with ease. “I’ve never done a show like this,” said Shaughnessy, a veteran of film and television, perhaps remembered best for a regular role on “The Nanny.” “It reminds me a bit of English pantomime. This is really quite fascinating. Odd as it may seem to invoke the name of Italian dramatist Luigi Pirandello in discussing a show at a dinner theater, it actually is appropriate. Pirandello, who won the Nobel Prize for literature in 1934, wrote “tragedies” that are considered forerunners of theater of the absurd. He is best known for a play hardly anyone has seen — “Six Characters in Search of an Author,” in which characters from an unfinished play wander into a rehearsal and implore the director to finish their story. In short, Pirandello made it OK for playwrights to free themselves from the restrictions of conventional storytelling, to break the “fourth wall” by allowing characters to speak directly to the audience and candidly acknowledging the artifice of theater. Carrothers had only two weeks to rehearse, which meant, among other things, coming up with questions for the actual games, because the script didn’t provide any. Joe Fox, the company’s vice president in charge of production, came up with as many as 400 questions, which they winnowed during rehearsals, Carrothers said. Actors Craig Benton and Peter DeFaria, who play the camera operators, used the equipment from the beginning and, according to Carrothers, took to it like ducks to water. Actor Tim Cormack plays the television director in the show, which obliges him to direct the live video feed the audience sees on the big screens from an upstage console. In the 30 minutes or so before the show starts, actors — including Jim Korinke and Todd Carlton Lanker — go into the audience in character and solicit volunteers to participate in the games. Carrothers said many spectators enjoy being made part of the action. But some don’t. As a creative artist, though, Carrothers likes watching what happens when you change the formula. Shaughnessy, for his part, seems to enjoy where is. He inherited a baronial title, and he studied law at Cambridge. But the acting bug, he said, can be traced to his discovery in childhood that he really enjoyed reading out loud in class. But he never could picture himself among lawyers. “That’s not my tribe,” he said. Shaughnessy has done stage and television (including an eight-year stint on the daytime soap “Days of Our Lives”), and in this show he gets to do both. But he has no preference. “Game Show,” whether it’s your cup of tea or not, does represent something that’s been happening more of late at the New Theatre: Productions that reflect playful, bold, even risky choices. Last summer Carrothers directed the musical “Joseph and the Amazing Technicolor Dreamcoat,” a show the company had done before, but Carrothers and his designers came up with a wild new take on the material, and the results were very funny. Then Dennis Hennessey staged the rather shopworn 1960s British farce “Move Over Mrs. Markham” and hit on the idea of setting the show at the turn of the 20th century, with corsets for the ladies, high collars for the men and antique telephones in the parlor. And now we have “Game Show,” which has so many unscripted moments that the potential for derailment is always bubbling just below the surface. Carrothers said the explanation is simple enough. He and Hennessy, who have been producing partners since the 1970s, said they have learned a thing or two through the years. “What you’re seeing out here is that I get a little more creative the longer I do it,” Carrothers said. “We probably wouldn’t have done ‘Move Over Mrs. Markham,’ but because Dennis had the idea for this mashup, that’s the whole reason we did it. Tweeted by Charles Shaughnessy 16 November . . . Comments? Penn State. without rushing to judgement, afraid it’s (the) Catholic Church all over again. Also fear it’s just the tip of the iceberg. ..and they wonder why the churches are empty!! So . . .What do the rest of you think about this topic?